Display of the process steps in the fabrication of the 2N339 series of medium power grown junction silicon transistors. This series was introduced by TI in 1956. 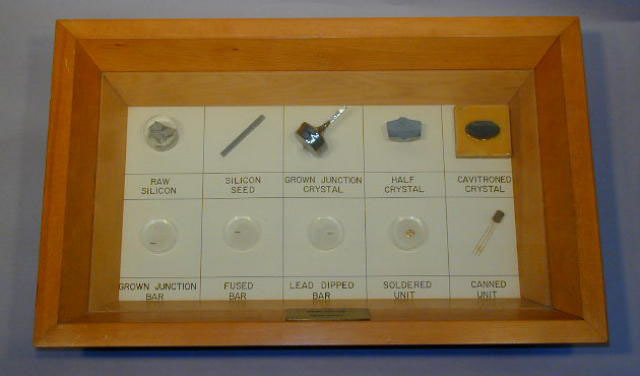 Items in display: 1)Silicon,high purity material 2)Silicon single crystal seed 3)Silicon grown junction crystal 4)Silicon,half crystal 5)Silicon crystal with Cavitron cut 6)Silicon transistor bar 7)Transistor bar with fused wire 8)Transistor bar with lead dipped ends 9) Transistor bar soldered onto header 10)Transistor canned. Related material in collection: G00010, 11.